Summary of today’s show: St. Joseph was silent in Scripture, but spoke through his actions as the provider and protector of Jesus and Mary as chosen by God. Scot Landry and Fr. Philip Merdinger of the Brotherhood of Hope talk about St. Joseph on his feast day and the many ways he provides a role model to Christians, especially to Catholic men, whether they are single, married, or ordained, on how to truly live the Good Catholic Life. 1st segment: Scot talked about St. Joseph’s feast day and his impressions of the saint, the foster father of Jesus and spouse of the Virgin Mary. Our guest, Fr. Philip Merdinger, who is on the faculty of St. John Seminary and the founder of the Brotherhood of Hope, has given many retreats and talks on St. Joseph. Fr. Philip said he has been a priest for 47 years and was ordained for the Archdiocese of Newark, New Jersey. After he had been ordained 10 years, he encountered the Charismatic Renewal and learned of covenant communities. They are people who pledge to live a particular Christian ideal in common. As a chaplain for one of these communities, he found a call to bring single lay men into deeper relationship to the Lord. They began households for single men in college or just out of college and out of it came the Community of Hope in 1980. In 1995, they were invited to Boston to make their primary house here. They now serve at Northeastern University and its surrounding schools, at Rutgers University, and Florida State at Tallahassee. The community of men became a community of religious brothers whose primary apostolate is to college students. Scot said most of the Brothers serve on secular college campuses. Fr. Philip said there are 19 of them, 3 of them priests. Scot said he encountered the Brotherhood about 8 years ago at an Advent retreat for Catholic men. Fr. 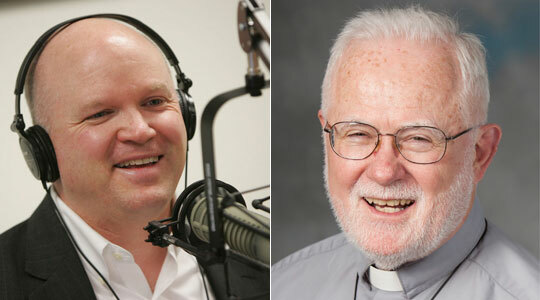 Philip said they started their involvement in Catholic men’s conferences and retreats after he encountered the leaders of the Cincinnati Catholic men’s conference, the largest in the country for many years. Fr. Philip said he has since become a regular speaker at these conferences, of which there are about 50 in the country each year. Scot asked him about his devotion to St. Joseph. Fr. Philip said he came late to his devotion in his life, but in working in the men’s movement, it kindled his interest in St. Joseph because he is a model for men trying to bring their wife nd children to heaven. 2nd segment: Scot said we don’t know much about St. Joseph from Scriptures and we don’t even have any direct quotes attributed to him. Fr. Philip said St. Joseph is the man who speaks by what he does, not by his words. He said we start by acknowledging St. Joseph is a married man and he and his wife would have lived according to the customs and norms of their societies. He had a wife he cared for deeply. He had to learn two very difficult things most men don’t have to learn: That she had a child not by him and that he had to take her into her home and live a celibate life because she was consecrated and set aside for a separate purpose. What stands out is his character. Once he knew that this was the road he needed to walk, he walked it well. He took Mary into his home and legally made Jesus a descendant of Jesus, and he loved and cared for her and provided everything she needed. Scot said God chose how he wanted his own Son to be raised. God wanted Jesus to be raised in a nuclear family, with a mother and father who loved each other and loved him. Scot recalled Fr. Philip said in a homily once that everyone should think that God chose Joseph from all men who would be born to teach his Son what it means to be a man, to work in the world, to care for other people, to be a committed family member. Then Fr. Philip asked those present, What if God called you to raise Jesus, but in fact He does call us to raise our own kids with that same love. Scot said Joseph, from the first moment of the angel’s message, his motivation was to protect Jesus and Mary from all of his being and was always open to however God was trying to communicate to him. Fr. Philip said Joseph was a just man, because his relationship to God’s law put him a place of honor. For any man, it’s their person relationship with the Lord that empowers them to be protector, provider, and governor. When Joseph is told to flee to Egypt, he leaves that very night. He takes the lead and takes action. A man can’t discharge his manly responsibilities unless he has a relationship with the Lord of Lords. Sometimes it’s not easy for me to have that relationship because men are doers, not thinkers. He encouraged men to seek that relationship with the Lord in order to discharge those responsibilities. Scot said we often hear “To Jesus, through Mary”, but for some men it might be worthwhile to consider that Joseph was also very close to Jesus as his father. For many men who struggle with providing and protecting their families or being a chaste man, St. Joseph might be the patron saint for them. Fr. Philip said the sudden departure from what they had built in Bethlehem because of the threat from Herod and the long road to Egypt and then to provide for his family, showed his trust in God who would provide for him. A man can come to trust the Lord in his personal relationship despite the enormous challenges. Trust is not easy for men. Scot said part of trusting might be praying to St. Joseph for humility. He said part of that humility is accepting a message from an angel in a dream. When we think God is leading us, we can pray to St. Joseph. Maybe he can help us to have the humility to accept suffering, like when Joseph and Mary heard the prophecy of Simeon was Jesus was 10 days old. Fr. Philip said part of being a man is to act when the time is right. Am I ready to have patience or am I ready to respond. Men often want someone to tell them what the right thing is to do and St. Joseph had that in abundance because of his relationship with God. Scot said imagine how Joseph and Mary felt when they lost 12-year-old Jesus during the caravan from Jerusalem. Then their sorrow or anxiety was replaced with joy on finding Jesus. What we learn here is that even the Holy Family had moments of anxiety and fear like we all have. Fr. Philip said Mary was not a happy lady: “Why have you done this to us?” And then Jesus responds in a way that must have been hard to understand: “I was in my Father’s house.” Then it says that Jesus returned with them and was obedient and Mary pondered these things in her heart. 3rd segment: Scot said the finding of Jesus in the temple was the last time we hear about Joseph, but our tradition is that Joseph died surrounded by Jesus and Mary after having raised Jesus. Fr. Philip said it’s a small-t tradition which reminds us of a crucial understanding for being a good Catholic, that the Son of God took flesh for us and his relationship in his family was like ours: Joseph would have cared for Jesus, would have held his hand in the synagogue to learn the Torah, would have taught him a trade. Joseph raised and cared for him. So it’s a lovely tradition that Joseph would have been surrounded in love by Mary and Jesus. Joseph is patron of the universal Church because he cared and protected for Jesus and the Church is the body of Christ. Scot said the Church is under attack in our culture today and so we turn to St. Joseph that we would have the strength to fight our battles well. Fr. Philip talked about the potential for this conflict to send us “into exile in Egypt” and how we should as St. Joseph to intercede on behalf our persecutors as well. Fr. Philip said when he was young, someone could just follow the practices of the faith, they could call themselves a good Catholic. But today it’s not enough anymore. We need to be able to defend the church, first in our own hearts, making these teachings our own. Scot said St. Joseph heard the voice of God and took action unquestioning. We need to be able to accept the Church’s teachings with an attitude that we want to obey the Church and if we’re not sure we understand, to give the Church the benefit of the doubt while we seek to understand. Fr. Philip said it’s obedient to the mind of Christ. He pointed out that it’s not just Church teaching, but it’s the mind of Jesus. Not something external coming from the outside, but something from the inside, in our hearts. Fr. Philip said doubt isn’t the problem. It’s when you just say No, I don’t care what Christ thinks. He said John Garvey, president of Catholic University of America, and Jim Towey, president of Ave Maria U, are excellent examples of Catholic lay leadership against attempts to restrict the Church. Scot discussed the Obama administration’s efforts to restrict the right to freedom of religion in favor of a manufactured right to free contraception. What’s at the root of that is that the idea that men and women today can’t control themselves and thus need free contraception in order to act irresponsibly and not bear the consequences. Fr. Philip said in the seminary, they encourage the men to understand that St. Joseph is a model for them of one who cares for the Church, just like the men will be if ordained as priests. They want to pray that they will become willing protectors of the Church, not just administrators or purveyors of sacraments. Scot asked Fr. Philip about he’s observing Lent. Fr. Philip said he’s been thinking more about the Cross and its central message.